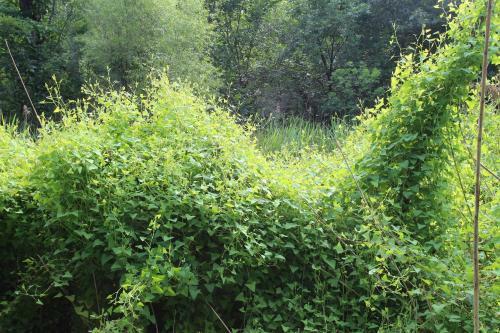 The finding of mile-a-minute weed near Knoxville, and the subsequent request for reports of additional infestations, has led to a flurry of calls regarding potential findings. Fortunately, none of the reports have been positive, but we appreciate people paying attention to plants in the landscape and notifying us when they spot something suspicious. 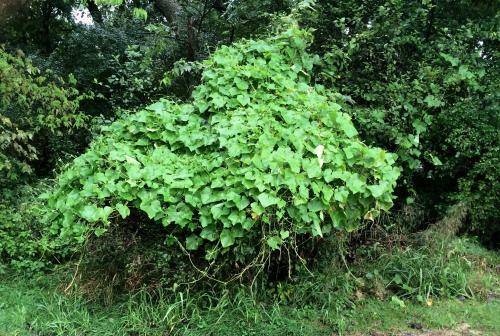 While a variety of weeds have been reported, by far the plants most frequently mistaken for mile-a-minute weed have been wild cucumber and burcucumber. Both of these plants are annuals native to Iowa. They are frequently found on banks of waterways and roadsides. They both produce tendrils that allow them to climb other plants and structures to heights of 25 ft. Burcucumber is more prone to move into crop fields than wild cucumber, and is a significant management issue due to prolonged emergence, tolerance to herbicides, and ability to interfere with harvest. 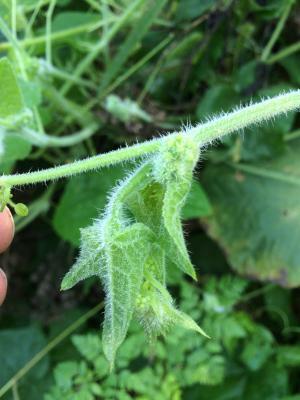 While the weedy cucumbers have similar growth habits, differences in leaf shape and fruit structure make it easy to differentiate the two species. 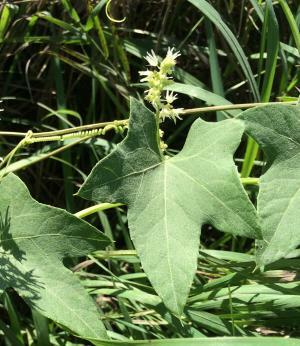 Wild cucumber has star-shaped leaves with five lobed leaves, whereas burcucumber has three to five shallow lobes that are much less prominent than those on wild cucumber. Leaves of both species are up to seven inches wide. 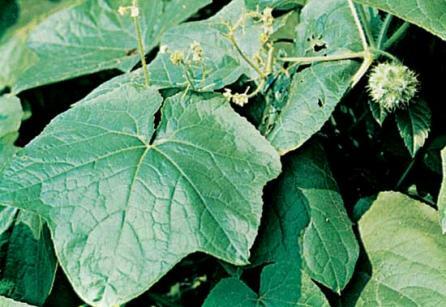 The leaves and stems of burcucumber are densely hairy, whereas wild cucumber has smooth stems. Leaves of mile-a-minute weed are triangular in shape, and the stems and petioles have small, sharp thorns. 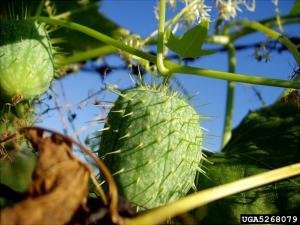 The fruit of wild cucumber is a spiny structure about two inches long, resembling a small cucumber. 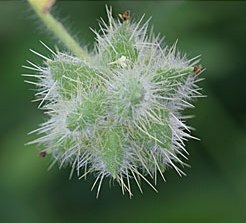 Burcucumber produces a cluster of single seeded fruit covered with stiff, sharp hairs. Each fruit is about ½ to ¾ inch in length. This has been a banner year for both weedy cucumbers, and they can be seen along many roadsides across Iowa. I suspect the above average temperatures and rain in June favored the growth of the native vines this summer. It is too late to control them except with manual removal. Plants in the Ames area have not produced viable seed at the time of writing this article, so removal would reduce problems in future years. Next year, monitor areas with current infestations and implement control strategies in early summer. Both species are tolerant of 2,4-D. Glyphosate, dicamba, or triclopyr can be used, but caution is required to avoid damaging other sensitive plants in the area.